Be sure to come to our weeklies! I’m going to take a stab in the dark that most of you have heard of Vocaloids. Personally, my favourite part of Vocaloid culture is the originality and creativity they allow producers. Unfortunately, sometimes, I’m not such a fan of the distinctive “robo-crooning” sound. That’s where Utaite come in! Utaite are humans that cover Vocaloid songs (mostly, although they do also cover other songs), meaning we have all the creativity of a Vocaloid song with the oftentimes more pleasant sound of a human singer. We’ll be looking at two of my personal favourite covers today – first up, papiyon’s E? Ah, Sou. as covered by Dasoku and 【Ren】. In this edition of Music Monday, lets explore the world of Vocaloid. I am sure most of you are familiar with Miku and her beautiful songs, and if you haven’t, I’d recommend you go through our Vocaloid tag. The song Senbonzakura was released in 2011 and describes Japan during the Meiji period. However it has contains rather dark themes, mentioning guillotines and ICBM. On the other side, the catchy tunes make it one of the most memorable Miku songs. The version I would like to show you today, is a violin cover by Lindsey Stirling. This cover is one of the best Senbonzakura covers I’ve heard, and the visuals make it that much better, so what better place to share my love for this great piece then on anime@UTS’ weekly Music Monday. Got something similar to this you would like to share? Send us an email at suggestions@utsanime.net, and you could be the next featured article on the website of UTS’ best (and only) anime society. Music Monday: My ClariS can’t be this cute! Hello and welcome to the first thrilling episode of Music Monday with your host Vadim. If you have you seen Ore Imo, Madoka Magika or Nisemonogatari you should be familiar with the group ClariS. ClariS is a Japanese pop music duo, consisting of high school girls Clara and Alice. The duo was formed in 2009 when the girls did a cover of the Vocaloid song Step to You. ClariS became popular because they were uploading their songs to the Japanese video sharing website Niko Niko Douga. After being signed by the Japanese record label SME Records, ClariS released their first major debut single Irony – The opening theme for Ore Imo. It was so successful that The Good Smile Company even released Nendoroid versions of Clara and Alice. Shortly after (February 2011) ClariS released their second hit single Connect which was used as the opening theme for Madoka Magika. Connect was awarded the Gold Disc for exceeding 100,000 copies shipped within a year. Their forth single Naisho no Hanashi which was composed by Ryo of Supercell was used in 2012 as the ending theme for Nisemonogatari. The latest piece from ClariS is the Moyashimon Returns opening theme: Wake up. Also a new single called Luminous will be released October 10th and will be the used as the theme song for the upcoming Madoka Magika movie. Picture It – Miku Sells! 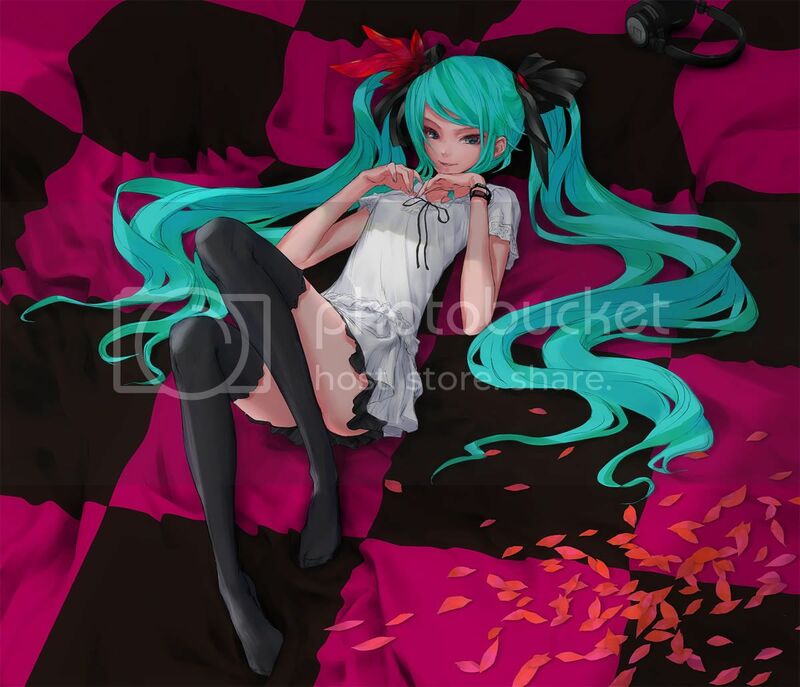 Not satisfied with conquering the world of voice synthesising software and the wallets of otaku worldwide with her teal awesomeness, art of Hatsune Miku has begun appearing in the unlikeliest of places! Shall we take a look? Picture It – There’s a Monday feeling to this post. Some of us who either follow recent anime seasons or the ever-growing world that is Vocaloid (particularly supercell’s works) may be familiar with this artist today, having either directly or indirectly sampled his work from either of these mediums. He has drawn official and album cover art for supercell singles, done the original character and setting design and official art for the world of Guilty Crown and designed and drawn for novels and visual novels. His style is eye-catching, vibrant, interesting and distinctive, and he is known as redjuice.